After purchasing a small rural property with a tiny log cabin I decided to do some renovations before winter. I found perma-chink online and ordered some samples. Three days later a huge box arrived filled with samples of nearly every product they sell. I was able to test out every striping compound,stain, and finish. This allowed me to figure out exactly what I needed to get the cabin finished exactly the way I wanted. I used strip it to remove the existing finish and stain and then I applied Newport colored stain from the Lifeline Accents product line. The finished results were beautiful and continue to get positive remarks from the neighbors and a few passerby's have even stopped to ask about the cabin and what was used to get such an awesome looking finish as well as the color since its quite unique. Ill continue to send people your way after such a great experience with your products and customer service. 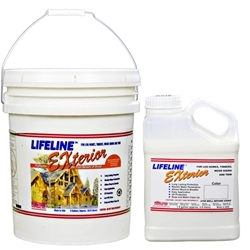 After a lot of work looking at over 12 different stains we went with the company we heard the most positives from, Perma-Chink Lifeline Exterior finishes. Not only did we save money purchasing the Lifeline brand we also saved time applying it! This is a wonderful log home product and user friendly, we could not be happier with the results. LIke the stuff. I even used it on my outbuildings and chicken coops. My husband and I purchased this stain last year when we were restoring our cabin. We wanted to save money, but also wanted a quality finish. I spoke with a Perma-Chink Rep who suggested adding UV Boost to Lifeline Exterior for extra UV protection. Also, we bought Lifeline Advance Gloss topcoat and applied that over top of it. The color we used (Cinnamon) looks wonderful, so we thank you for a great product!